The buying problem is rarely the lie; it is often that reality is disclosed in terms that can mislead. The first part of this two-part feature (The Wanderer June 2013) discussed the issue of some advertising and advertorial claims being unlikely to be achievable in typical and realistic use. There is also the increasingly common practice of quoting ‘rated outputs’ that are sustainable only for brief periods, particularly when the product in question exceeds 250 C.
This is not necessarily detrimental as long as this is clearly revealed. If that maximum rated output is only rarely required, such derating makes both technical and monetary sense. It is for example pointless to rate a fridge’s cooling ability in an ambient temperature of (say) 500 C, when that is unlikely to be encountered by all but a very few buyers. The EU addresses this with its Climate Class system that requires such fridges to maintain their claimed performance over clearly defined temperature ranges - with maximum operating ambients ranging from 320 C to the T-rated 430 C. As such fridges are costly, it makes little sense to buy a T-rated fridge for use in Hobart, but very much so if travelling in Australia’s far north (even in winter). Makers of portable generators usually quote two ratings: one sustainable only for short periods, and another (typically 80% of the former), for longer term use. There is often also a clause referring to ambient temperature. Switch-mode inverter makers too, use similar ratings. This may catch out those accustomed to the inherent overload capacities (but not necessarily heat tolerance), of the bulky and heavy toroidal transformer inverter equivalents. These are typically rated at 100% load (subject to temperature) but, by virtue of their design can often cope with surges of up to twice that with ease. As the ability to do is inherent in that transformer (by far the major component cost of such units), it makes sense to scale the rest accordingly. This ability exists also in the input components of switch-mode units, but these represent only a small part of the overall cost. It is thus far cheaper, and is more electrically efficient, to scale them in a similar way as are generators. As long as buyers are made aware of this, it makes a lot of sense as not all loads need that surge capacity. Some loads (e.g. big power drills, angle grinders, cut-off wheels etc) however do - and also the ability to be run for long periods of time in often hot places. Australian Standard AS4509.2 suggests a surge factor of seven for electric motors, water pumps, fridges, air conditioners, and washing machines; three for kitchen appliances and other electronics equipment, but none for resistive loads such as simple heaters. This is sometimes overkill as many have ‘soft start’ (that reduces surge current). As an inverter converts (say) 12 volt dc to a higher voltage ac, it inevitably generates heat: typically 5%-7.5% of its output at the time. This increases local temperature around the unit, although some may be fan dissipated. Such heat causes electronic components to degrade, insulation to become brittle and soldered connections to expand and possibly crack. To protect against this, most inverters are programmed to reduce power, or shut down if they exceed programmed limits. Whilst most manufacturers reveal this, they tend to speak of ‘ambient’ temperature, but often do not make it clear that they are referring to the temperature within the unit itself. Most quote peak output at 250 C, and derate output above that, but a few manufacturers’ products deliver rated output at much higher temperature. Powertech’s new switch-mode sine wave inverters are specified to deliver full rated power up to 630 C. They are stated to continue to run, but sound an alarm, from 95% -100% of rated output, at 105% after 60 seconds, and after 5.0 seconds if the draw exceeds 120%. The cost of quality switch mode inverters is often a third or so that of similar transformer types, most of which have heat derating restrictions anyway. 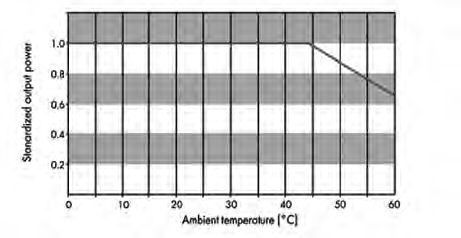 One well known 1600 watt unit produces 900 watts at 600 C.
This graph, of a typical SMA inverter, shows how output is derated above 450 C (corresponding to an external ambient of 250 C). Pic: courtesy SMA Inc.
As noted earlier, lead acid batteries are a special case: their electrochemical reaction, between electrolyte and lead plates, is substantially heat dependent. A warm battery thus absorbs charge very much faster when hot. To avoid battery damage, charge current must be reduced accordingly. Likewise a cold battery is restricted in the peak current it can accept or deliver. In some instances, errors can occur by overlooking seemingly fundamental considerations. A classic example is that of charging efficiency in that it has become virtually a mantra that, because about 110 amp hours is required recharge a 100 amp hour battery, the charging loss is thus around 10%. This overlooks that a 12 volt battery delivers from about 12.7 volts to 11.8 volts or so, but needs 13.2-14.7 volts to recharge. The energy (in watt hours) so needed is such that losses are higher. This matters little to those charging a battery from an alternator or mains power (it simply costs a wee bit more).It is a different matter when calculating the energy needed from a big solar array to charge a large battery bank. Much of that discussed is abundantly clear in specifications from reputable vendors of quality product, but poses a major trap for the electrically naive seeking ‘bargains’ on eBay. Reputable vendors do sell quality product on eBay, because many people use such sites routinely, but in areas such as this, it is not unknown for the less scrupulous to have two different sets of scales. One is for describing that offered - the other for that supplied. It is not uncommon, for example, to find inverter output quoted as that achievable for only a fraction of a second at 250 C, and derated substantially thereafter, but without that essential qualification being revealed. Or to have meaningless claims such as ‘output is up to such or such’. The true ratings (and deratings) can often be checked against the manufacturer’s original specifications, if its identity can be located. This is not always possible, as otherwise identical products tend to marketed under various names - none of which reveal the maker. If so, why buy a product of unknown provenance? The author researches, writes and publishes books (and articles) on all aspects of subjects associated with campervan, motor home and fifth wheel caravan usage. Over the years they have become noted for the critical approach typified in this article.